Newcastle, are you ready to putt your stuff? Holey Moley is the craziest round of mini-golf you’ve ever played! 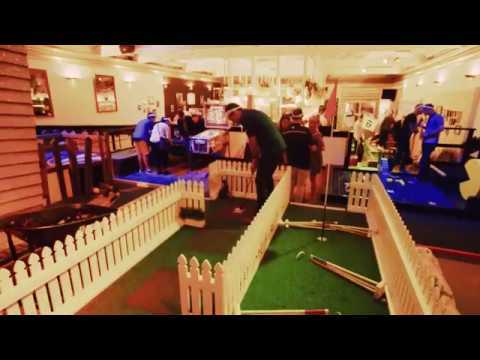 We’re a mini golf course and bar that brings fun to a new level. With two different nine-hole courses to choose from, you’ll putt your stuff around 18 uniquely themed holes. After you have worked up a thirst, settle in at our Caddyshack bar. With drinks, cocktails, tunes and great grub on offer, The Caddyshack will take care of all their off-the-green needs. We are open as normal during the holiday period. All day, every Monday we are doing Unlimited Activities for $30! How's that for a deal? Tuesday from 5pm, spend $7 on Food or Drinks and we’ll give you 9 Holes of Mini-Golf for free so you can really putt loose! Universi-tee off each Thursday from 5pm, with 18 Holes of Mini-Golf for $10 when you bring your Tertiary ID along. Looking for a way to spend your Sunday? With $20 Unlimited activities and drinks specials all day it's the perfect Sunday session! If you book and hold your kids party at Holey Moley Charlestown between the 1st January - 30th April 2019, the birthday child goes free! Okay, let’s get to the point. What's the deal with alcohol at Holey Moley Charlestown? The rumours are true. We have a fully licensed bar and a delicious list of cocktails. You ALWAYS need your ID to enter our Charlestown venue and they will be scanned as of 8pm (Even if you think you are too old, this also applies to you). What can we do before and after our rounds at Holey Moley Charlestown? How do I book Holey Moley Charlestown? How long does the golf stuff take at Holey Moley Charlestown? What if I wanna bring the whole squad to Holey Moley Charlestown? Can I bring the kids to Holey Moley Charlestown? Where do I park at Holey Moley Charlestown? The Blue Carpark off Pearson St is the best place to drop your buggy. Can I just turn up to Holey Moley Charlestown? Can I cancel or change my booking for Holey Moley Charlestown? How do I get to Holey Moley Charlestown on public transport? Take the train and jump off at Cardiff station or take the bus and jump off at Pearson Street. Both are only a five minute walk from us. Jump onto the NSW public transport journey planner here and map out your journey. Do I need to bring my ID to Holey Moley Charlestown?